Hootenanny 3 is a trio, occasionally quartet, of acoustic musicians playing a range of music from American bluegrass and old time to traditional Scottish and Irish music, there’s even some occasional western swing. 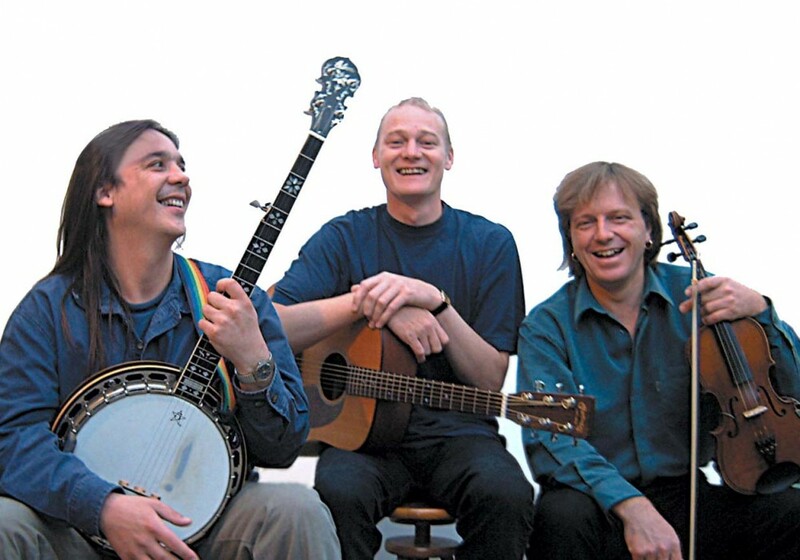 Hootenanny 3 is a trio, occasionally quartet, of acoustic musicians playing a range of music from American bluegrass and old time to traditional Scottish and Irish music, there’s even some occasional western swing. Don’t expect the distinctions between these different forms of music to be clearly marked out though. Good time music with very little respect for history or geography. Hoo’tenanny n. (coloq.) Informal gathering of musicians, celebratory event. Dominic Harrison sings, plays guitar and bass with an authority that few musicians ever achieve. Dominic grew up in a musical family and his first performances were as a ‘boy wonder’ in the family band, Strange Relations. Dominic moved to Bath in the early 90’s to play bass for Southern Exposure, a band led by North Carolinian singer/songwriter, Randy Gambill. Dominic and S.E. banjo player Leon Hunt went on to form the very first incarnation of Daily Planet. Leon Hunt is deservedly the UK’s best-known 5-string banjo player. A former student of America’s banjo virtuoso Bela Fleck, his exploits have been making waves on both sides of the Atlantic. His trademark has always been a healthy disregard for the banjo’s traditional boundaries, experimenting with techniques, sounds and technology and using his earlier musical influences (both of Leon’s parents are jazz musicians) to ultimately make it a more versatile instrument. In 1999 Leon decided to take a three-year sabbatical from touring to do a degree in Music and Music Technology in his home town of Bath. Since graduating he has returned to his career as a professional musician with refreshed enthusiasm. Seasons playing with the Royal Shakespeare Company and The New Vic and composing the soundtrack for a production of ‘To Kill a Mockingbird’, (also at The New Vic) have kept Leon very busy. However, he still managed to find the time to record his first solo album, Miles Apart. Henry Sears is an amazing fiddler; his career to date has crossed many musical borders. Rooted initially in Irish Traditional Music, for which he made a name for himself in the 1980’s with the highly acclaimed ‘Afterhours’, he has since been called on to embrace flavours and styles from Eastern Europe to Nashville. With a quick ear and natural flair for improvisation, Sears has been in constant demand as a session player for TV and studio recordings for artists such as Sting and Alison Moyet, and most recently with Malachi Cush, from the BBC’s Fame Academy.